In many ways, the needs of refugees in Beirut have moved from the category of relief to development. Now that’s not to say that there are not refugees who are hungry or in desperate need of shelter, because there certainly are. But I’ve noticed a subtle shift in many organizations from providing food and clothing to looking for more long term ways to help refugees do more than just barely survive. Our church, for example, is offering English classes, which is especially desirable for those hoping to emigrate to the West. For months and even years, many refugees have been living on handouts from the UN, churches and other charitable organizations. But this is neither sustainable nor best practice for the long term. The old saying about giving a man a fish versus teaching him how to fish is the perfect analogy for the needs of many refugees that I know. They don’t want or need handouts as much as they need an opportunity and the skills to work in order to provide for themselves and their families. Some friends of mine run a small house in a neighborhood where many refugees come to beg. They’ve opened their doors to these women and are trying to offer them another way, a way that restores dignity and puts the power to provide and care for their families back into their hands. The women have learned how to make notebooks and are selling them as a way to support themselves. The notebooks are cute, nicely made and a simple way that you can be involved in getting a family off the streets. They come in 2 sizes and can be purchased at Zenjabeel Coffee Forum in Hamra or from the Fajr Beirut Facebook page. Words are cheap. Do something. I have been heartsick over the way the tragedy in Paris has so quickly been turned into an opportunity to spew hatred against the most vulnerable – those fleeing the same evil that blew themselves up in the heart of Europe. I thought about writing a post about what I believe a Christian response should be to the refugee situation. Put my masters of theology into good use. I also had the naive thought that maybe if people just KNEW some of the stories of the refugees they were calling such hateful names, maybe that would change the way they thought and talked about them. I am in a unique position after all, in that I interact with refugees on a daily basis. But I (re)learned very quickly that trying to reason and discuss with someone who is blinded by fear and hate goes nowhere. The names that I was called paled in comparison to the adjectives used to describe the men, women and children THAT I KNOW PERSONALLY who want nothing more than to live a life with their families without fear. I was tempted to take myself off facebook completely because honestly my heart just could not take it anymore. But what changed my mind was the many messages I received from people wanting to know how they can help refugees RIGHT NOW. I have no desire to get into a political discussion about vetting processes and the responsibility of the government. Nor will I have another conversation about who Jesus actually meant when He said to love your neighbor. But I certainly can direct you in ways to help refugees here in Lebanon. Even though it seems that those who hate the most seem to be talking the loudest, I know that most people really do want to love, want to serve, want to help, but just don’t know how. So I’ve compiled a list of faith based organizations and groups that are working with refugees here in Lebanon that I personally know and trust. I know what they are doing is good, and they will use your gifts well. This list is certainly not exhaustive. There are plenty more doing great things here in Lebanon, and I’m not even touching those who are helping refugees in Syria, Iraq, Jordan, Turkey or Europe. But for those of you wanting to get involved, this is a place to start. This is the ministry of our church here in Beirut. We currently serve around 1400 Iraqi and Syrian families. Gifts given are used to provide refugees with food vouchers, home cooked meals, winterization items such as blankets, mattresses, heaters and gas, rent money, school tuition, medical expenses and more. Besides collecting and distributing clothing, toys and household items, I help run a music class for moms with their small children, providing a small reprieve from the stress and tragedy that follows their every step by allowing children to dance and sing and laugh with their mamas. This is the parent organization for the seminary where Caleb teaches. “LSESD’s humanitarian response to the Syria crisis served over 5000 households of vulnerable Syrians in Lebanon and Syria with food aid and medical assistance, also non-food and winterization items such as blankets, mattresses and stoves.” They have different aid packages set up, for example $70 gift will provide a family with 4 blankets and one mattress, crucial to surviving the coming winter months. For more information and to give, click here. Tahaddi is an education and health center in one of the poorest areas of Beirut where many refugees have settled. Their “aim is to serve socially vulnerable families and victims of conflict and discrimination, regardless of their nationality, religion and social background.” They currently have approximately 120 students attending school at the educational center, provide medical services to over 2500 patients, and provide follow up care to the most vulnerable families through in home visits by Tahaddi’s social workers. For more information, check the website here. To give to Tahaddi’s current campaign for the health programs, click here. A friend of mine living in one of the suburbs of Beirut runs a school program for 37 refugee children in her neighborhood, where many refugees have settled. There are no formal camps set up in Lebanon, which means refugees often end up in the poorer parts of the country, living many in a small apartment, often being taken advantage of by their landlords. In addition to the school program, refugee families in need are provided with food packages and winterization items such as jackets, blankets and heaters. Some dear friends of mine spend much of their time working with refugees in the Bekaa Valley and the North, both very near to the Syrian border. The do home visits to assess the needs and then provide relief through the distribution of food, clothing, blankets, hygiene kits and more. By sitting and having a cup of coffee, listening to the stories of those who have fled everything they know, and praying for their families, those who live on the margins are reaffirmed of their value and worth in the eyes of God. To give to the general fund for refugee work in the whole region, click here. To give specifically to the work in Beirut and the Bekaa Valley, click here and enter the code B12SyrRspLeb in the comment section. To give specifically to the work in North Lebanon, click here and enter the code B12NorthLeb in the comment section. There are also plenty of international organizations doing good work among refugees here in Lebanon and across the region. Samaritan’s Purse is one. It you’d prefer not to donate through faith-based organizations, there are also some great options. I don’t work as closely with these groups, but I’m certainly willing to do a little research if anyone is interested. There was a story going around social media last week about an employee at Dunkin’ Donuts Hamra who beat up a Syrian child beggar. There were pictures of both the boy and the employee circling with the story. Since then, there have been claims that the boy wasn’t beaten as bad as the pictures showed, that the employee in the picture wasn’t actually the one who hit him, and that the one who did had been fired. When Dunkin’ Donuts didn’t apologize right away, calls to boycott the chain were made. I don’t know what parts of the story are true, nor am I judging whether the idea of a boycott makes sense. What I was absolutely flabbergasted by were all of those actually defending the employee who allegedly beat up the boy. Not defending him in an “innocent until proven guilty” way… but actually defending his right to hit the child. So according to the masses on facebook, when is it okay to hit a child? 1. When he is rude. 2. When he is annoying. 3. When he disturbs your morning coffee. 4. When he is bad for your business. 5. When he is inside a cafe/restaurant/store/building. 6. (And my “favorite”) When he is a refugee from a country that used to oppress you. Thankfully, there were some arguing with these idiots that no matter what he had done, no one should ever hit a child. But still. What a messed up world this is. We generally answer that, yes, we feel very safe. We feel more safe walking the streets of Beirut that we would in any major city in the States. And it’s true. Of course, we live in a volatile region. Car bomb assassinations and rocket attacks happen. We went through a spate of kidnappings last summer that kept us indoors for a while. But, petty crime has always been relatively low. Random violent crime is even lower. However, it seems that things have been changing recently… at least the talk around town is that crime is rising. And of course, there is a very easy scapegoat. Many people, news organizations, politicians blame the rise in crime on the influx of Syrian refugees into Lebanon. Now I don’t doubt that desperate people often do desperate things – especially when they are being taken advantage of right and left. Yet at the same time, blaming the refugees for the (perceived?) rise in crime borders on racism. But what is really awful is the way several communities have decided to “fight” crime in their cities. 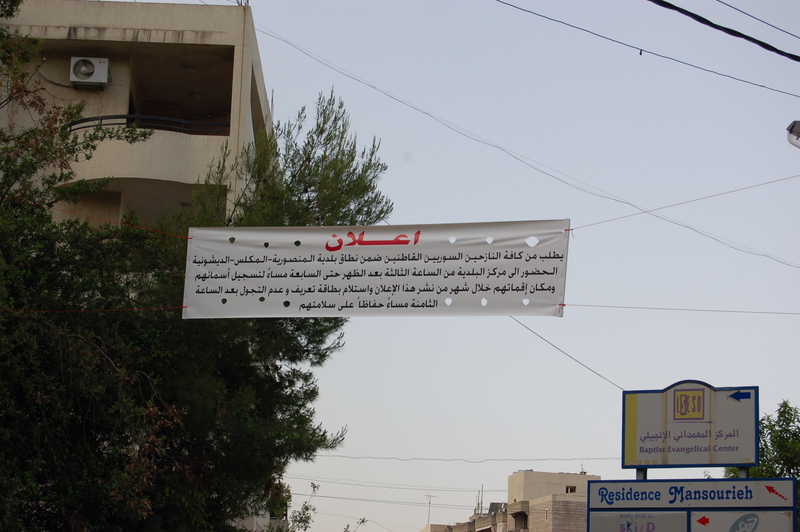 This sign in Mansourieh (where Caleb teaches) advises all Syrians to register themselves and to stay inside their homes after 8pm “for their own safety.” Apparently some of the other cities are not quite specific and just address ‘foreigners’…. but you can bet they wouldn’t stop us if we were out after 8. The old faces are still there. The man with the swollen foot begging just off Bliss. The old men selling lottery tickets outside the hospital. The three women selling gum on the steps of Idriss. The group of a dozen or so Palestinian kids begging for money and food around the cafes on Hamra street. Recently a politician here said he believed there were one million Syrian refugees in Lebanon now. Official counts are somewhere around 400,000. (I started writing this post more than a month ago, don’t know what the most up-to-date numbers are now.) Either way, that is a lot of hungry, desperate people. We’ve always struggled with how to respond to the beggars we pass every day, and that struggle has only multiplied in the past few months. We still have way more questions than answers about what the needs truly are and the best way to help. Ideally, relationships would be built, stories would be heard, the help that is truly needed would be given. I’m trying to do that. Helping the woman who wants milk for her baby with breastfeeding, giving clothes that my girls have outgrown, giving alef or 5…. but it feels like a drop in the bucket when in 3 minutes I pass a dozen more women with hungry babies on their hip. “For I was hungry and you gave me something to eat. I was thirsty and you gave me something to drink. I was a stranger and you invited me in. I needed clothes and you clothed me. I was sick and you looked after me. I was in prison and you came to visit me….” (Mt 25:35-6) I mean, it doesn’t get much clearer than that. I want to help. I don’t always know how to help. I need wisdom. I need grace. This post feels disjointed, because my thoughts are as well.